OMAHA, Neb. — Six hours a day Tony Solerno is working hard to get his mind and body back in shape. On October 4th, doctors found a tumor on Tony's brain. Since his surgery, Tony has had to stay at Madonna Rehabilitation Hospitals undergoing acute rehabilitation for several hours a day. Tony's wife Amy is working full-time and taking care of their two children. "People keep telling me to take care of myself and that just feels like another thing on the list," said Amy. Under the Family Medical Leave Act, Amy can take up to 12 weeks off from work to take care of Tony, but that time is unpaid. Some Nebraskans do not even meet the requirements for this unpaid leave. For example FMLA does not apply to people who work for a small company that has less than 50 employees within a 75 mile radius. The Nebraska Department of Labor didn't have data on how many employees are covered under FLMA, but the department did say roughly 31 percent of all working Nebraskans are employed by a company that has less than 50 employees. 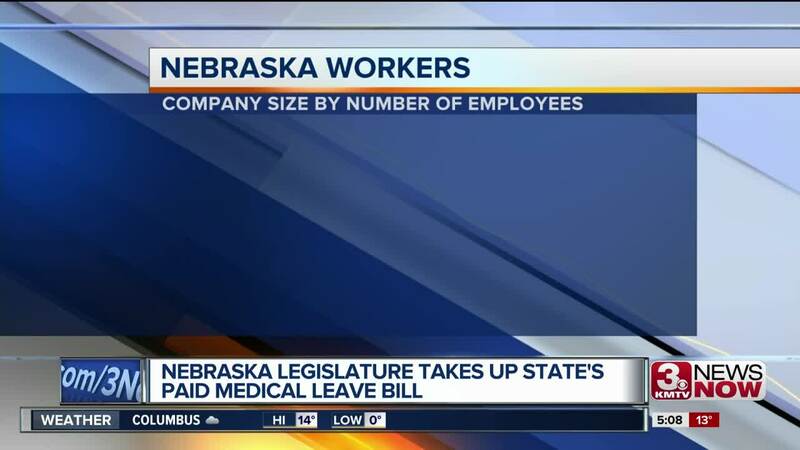 That means at least 30 percent of all working Nebraskans do not qualify for this medical leave. Right now, State Sen. Machaela Cavanaugh and Sen. Sue Crawford are trying to pass a bill that would give working Nebraskans up to six weeks of paid leave. It would apply to any business subject to security law, which senator Crawford said applies to around 90 percent of Nebraska's businesses. While business owners would essentially be taxed up to one percent of their employees' pay, Cavanaugh said smaller businesses would be able to offer similar benefits to larger companies for significantly less money. "It's easier for them to compete with the larger businesses who can afford more generous benefits," said Cavanaugh. The paid leave is capped. Depending on the person's salary, an employee could get up to roughly $3,000. The bill is under consideration with the Business and Labor Committee.